Obviously you're going to need euros for your trip to France. You can get euros at your bank in the States, but in some cases you have to ask for them ahead of time so the bank can order them for you. I should mention this isn't absolutely necessary; you can get euros fairly easily right away when you arrive in France. There are always ATMs at the airport, but you may not find one right away and you may be tired/jetlagged and you may simply not want to deal with it. So you're probably better off getting 100-200 euros before your trip, just for the taxi from the airport and/or a snack or whatever before you hit an ATM somewhere in Paris. No need to travel with a huge wad of euros on you. While in Paris, I recommend simply using ATMs whenever you need cash. Never use money-changing places if you can help it! They'll always charge a rate which is much higher than what you'll pay through a normal ATM at any bank. With ATMs, you'll be charged a small fee for the international transaction, but in my experience it will always be lower than what a money-changing place will charge you. If you need to ask someone where there's an ATM, they probably won't know the term "ATM" even if they speak English pretty well. The French term is distributeur de billets, generally shortened to just le distributeur. They all offer English options when you swipe your card. As for credit cards, you can almost always pay with your credit card in restaurants, stores, et cetera; basically all the same places you'd expect to be able to use your card in the States. (Note: if paying by card in a restaurant, you won't be able to leave the tip with your card. See my page about Tipping for more info.) Fyi, the French term for a credit card is a carte bancaire, sometimes abbreviated as CB on signs (like "CB minimum 10€"). It's a good idea to inform your bank and credit card companies that you'll be traveling in France (and any other countries you're visiting) before your trip. Otherwise there's a possibility you'll arrive, try to pay for something, and find that your cards aren't working. The banks sometimes deactivate cards when they see that they're suddenly being used in another country, for obvious security reasons. Even if this happens to you, it's very easy to fix; just call the 1-800 number on the back of the card, explain your situation, and they'll usually be able to reactive your card immediately. 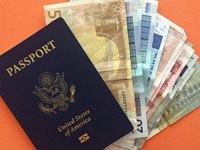 However, making a call to the States while abroad can be complicated for its own reasons, so you're much better off just notifying your bank and credit companies before traveling. I've used my American credit cards all over France, and they work fine everywhere, with one weird exception: the ticket machines for the Métro and RER (regional trains). For many years most American credit cards were lacking the little metal chip that's been on European cards for ages (although these days they're common in America too). Anyway, the chip is required for the ticket machines, and this might sound like not a big deal but it can be really annoying when you first arrive at CDG and you want to buy an RER ticket to Paris. The machines may not take your American card if it doesn't have the chip, and while they do take coins, they often don't take bills. Who the heck is arriving in France with 12 euros in coins in their pocket? If this happens to you, no worries, you just have to wait in a long line to buy your ticket from a human being, and you can use cash or, I'm pretty sure, your American card. Weirdly, whenever an actual person is taking your card, American cards always work, even without the chip. It's just the machines that don't like 'em. 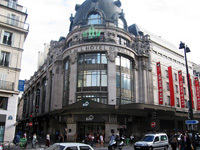 The USD to euro exchange rate changes all the time; in my time in France (i.e. since early 2005) I've seen the euro as high as US $1.61 and as low as US $1.09. While living in France I made my living as a freelancer working exclusively for American clients, so I was paid in US dollars while living my life in euros. So the exchange rate was something I had to watch very closely, as it really affected my day to day financial situation — imagine, my rent was essentially a different arbitrary amount each month! So anyway, I check www.xe.com frequently to see where the exchange is. 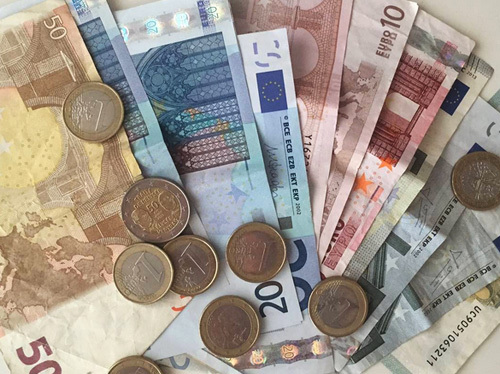 However you monitor the exchange rate, it's a good idea to check it within a few days before your trip to get a pretty good idea of what the rate will be while you're spending money in Europe. 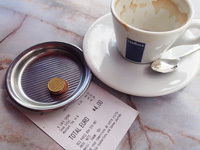 While the rate changes all the time, it usually doesn't change more than a penny or two a day, and often stays within a one- or two-cent range for weeks at a time, so if you're spending a week or two in France you can be reasonably assured the rate won't change drastically within that time — but no promises!